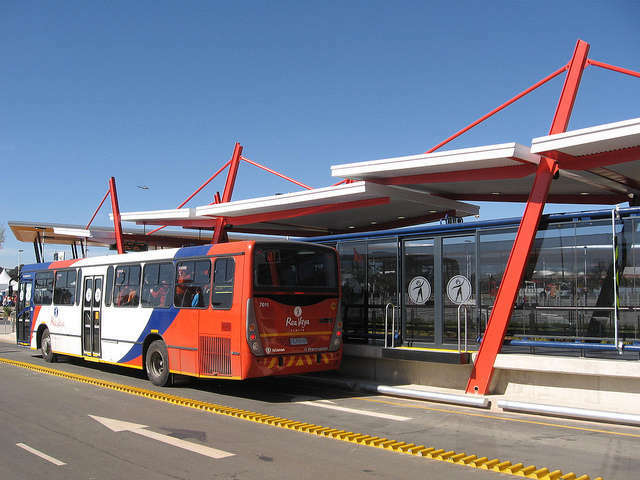 Nasrec Station, near the Soccer City Stadium in Johannesburg, South Africa. Photo by Aileen Carrigan – EMBARQ. This is the second round of a two-part series weighing the benefits of natural gas versus low-sulfur diesel as fuel sources for buses. Natural gas won Round I because when we focus on tailpipe emissions it is less toxic, and provides a good short-term solution for Indian cities to reduce harmful particles pollution. The winner of round two: will be the fuel and exhaust technology combination that offers the best long-term solution. Considerations will include fuel production environmental impact; technology cost; and the potential for technological improvement. Are there instances in which natural gas is worse than diesel for the environment? “In the transport sector passenger cars fueled by compressed natural gas are up to 10 percent less efficient than gasoline cars, and CNG buses are up to 20 percent less efficient than diesel-fueled buses” (p. 21). Also, independent studies conducted in London and Australia, have shown that the highest quality diesel, fitted with a special type of filter can achieve lower emissions rates than natural gas. Mid-game commentary: What holds promise for diesel vehicles is the application of state-of-the-art filters in combination with diesel containing less than 50 parts-per-million sulfur. For natural gas to achieve a net benefit to the environment, the production process must be further refined to capture escaping methane, at a great return on investment. Aren’t natural gas buses much more expensive than diesel buses? YES: The higher upfront cost, and subsequent maintenance cost of natural gas vehicles must be considered. Both natural gas and diesel prices have risen, but natural gas prices are increasing at a faster rate. But keep in mind that subsidies on diesel, in India for example, are decreasing by the day. NO: While capital (i.e. upfront) costs compared to diesel are higher in the case of natural gas, operational costs are less, due to the lower fuel cost of natural gas, in comparison with rising petrol and diesel prices. Taking health and environmental costs into consideration, a Swedish study found that, when diesel trucks operate on the most refined fuels and are fitted with advanced filters, they cost more than natural gas vehicles to operate. Mid-game commentary: When making decisions, it is important to consider the full lifecycle costs of vehicles. These costs also reflect local conditions because – even with the same basic upfront cost for a bus – operations, maintenance, and infrastructure costs can vary significantly from region to region. Fuel subsidies offered by national or regional governments may also influence the choices of local agencies that are changing to a particular fuel type. If a city were to change its complete fleet in one shot, then would natural gas inhibit the introduction of better engine technology in the future? YES: The trouble with a complete switch to a natural gas fleet is that a city investing in natural gas would be saddled with today’s technology for years instead of phased modernization, which can be ensured by phasing out a proportion of vehicles every year. If the city desires to remain progressive, it might consider keeping a number of options open, including low-sulfur diesel. NO: Moving to natural gas will not only help us to get emissions reductions of the highest standard currently possible – it will also immediately and significantly reduce cancer risk from diesel vehicles. Since natural gas is a cleaner burning fuel, it is possible to meet much tighter standards within a short time frame and make a quantum leap. Mid-game commentary: We cannot predict what future developments in natural gas technology will bring, nor can we determine for certain the continuing availability and price patterns of a natural resource such as petrol or natural gas. In the future, improved diesel filtering technology, reduced health risks, and more affordable fuel prices may render ultra-low-sulfur diesel a clear winner for some cities. Dependence on a single fuel for a public transport system is not ideal, and having a balanced portfolio of fuels and technologies might be the best bet. We don’t need a clear winner here. There is no silver bullet for fuels for public transport vehicles — emissions reduction technologies are key. In the long run, the dependence on a single fuel for a public transport system is not desirable. We win by recognizing the various benefits of different fuels in addressing local and global issues. It is more than a debate between fuel types, but rather an understanding of the key role that emissions reduction technologies and improved fuel economy do for reducing emissions from all fuels, especially at the macro-level, when governments take into consideration the emissions and costs from the production process. In the long run, as discussed in the recent post on the electric-powered tricycle program in Manila, the real value for people in communities, lies in governments taking the time to understand the environmental impact of a fuel’s production and extraction process, in addition to its combustion; the lifecycle costs of a given technology; and the resources available to them in the long run. Benoit Colin, Erin Cooper, and Elise Zevitz also contributed to this piece.